As a North West based business it’s always interesting to understand the changing employment landscape in the local area and it’s awesome to see this recent research demonstrating huge growth in the earning potential of the North West’s workers as competition for employees continues to increase. The 5% year on year growth places the North West of the majority of regions in the UK, with only North East, Yorkshire and Humber performing better. With the national average rate of pay being £26,500 according to the ONS, the average rate of pay in the North West having reached £30,175 is a clear indication of the strength of the recovery in the region with employers expanding salaries speedier than those in the South. Growing skills shortages, which have been exacerbated by an historic south-bound brain drain are leading to increasing pressures on the North West’s economy, however investment in infrastructure and housing, as well as a cultural shift within North West businesses will be further required to enable the North West to rapidly realise the potential of the recent growth trends. It’s anticipated that the North West will become a target for potential-employees from outside the region as they maximise their earning potential proportionate to living costs, with areas surrounding Northern cities providing untapped, inexpensive accommodation for commuters (ie areas in East Lancashire such as Rossendale providing relatively untapped potential for Manchester commuters). Manchester is one of Adzuna’s top 10 best places to find employment with 0.31 jobseekers for every opening, however it’s important to focus on the role of the North’s other cities in creating a balanced economy and for the present government to continue its focus on the Chancellor’s North West Powerhouse scheme, which advocates creating a “second engine” in the UK’s economy to counterbalance the South East. 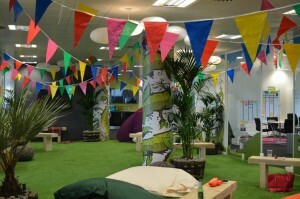 As a Manchester-based tech business we’ve focused on creating a culture centred around fun, creativity and innovation, where employees are completely engaged, live the brand in an environment where they want to spend each day and where the best talent the area has to offer, can be attracted and retained. Competitive remuneration is an essential element in this proposition. As the economy continues to grow out of the current recovery it’s likely that the major cities will continue to grow rapidly when compared to more local businesses, however HR teams should be constantly reviewing salaries and salary expectations and providing the necessary business cases for pay reviews to ensure they continue to keep in line with local competition for talent in order to minimise the disruptive impact of employees looking for new roles, which can result in absence management issues, as well as the cost of recruiting for replacement employees, which the CIPD estimates costs on average between £4,800 and £7,000, and which some a recent study by Oxford Economics estimate can cost around £30,000.